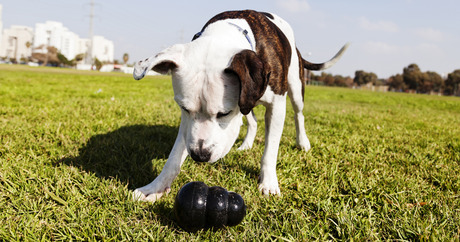 Kong, or similar food-filled chew toys, are a great way to feed your pooch, keep him entertained, and develop problem-solving skills. We asked DogTimers and their friends to give us the ingredients of their favorite Kong cocktails, and got responses ranging from simple to complex. Note: These recipes are not intended to meet all of your dog’s nutritional needs. Please consult a vet or veterinary nutritionist to learn about how to feed your dog a nutritionally balanced diet. Pet obesity is a huge problem, so please Kong responsibly. Do you have favorite Kong ingredients? Let us know in the comments below! Interested in other dog-food recipes?